GREENBURGH, N.Y. -- Residents near the Payne Street bridge might be inconvenienced as repairs begin at the end of June. This summer, the installation of the piles for support of the existing MSES wall will begin. They will have one or two drilling rigs operating alongside Payne Street through this time period, Paul Tirums an engineer for the State Department of Transportation said. "There will most likely be days when there will be flaggers on Payne Street to control traffic flow through the work zone," Tirums said. At the start of August, some preliminary work on the Sprain Brook Parkway in preparation for the traffic shift and the bridge work will begin, Tirums said. This work will be performed as night work under temporary lane closures, Tirums said. On August 21, a traffic shift will begin on the Sprain onto the northbound bridge reducing the number of lanes in each direction from three to two, Tirums said. This traffic shift and lane reduction is anticipated to last 90 days and therefore hopefully be completed by November 20th – before Thanksgiving weekend, Tirums said. Payne Street between Bryant Avenue and South Montgomery Avenue will be closed for about 180 days, Tirums said. 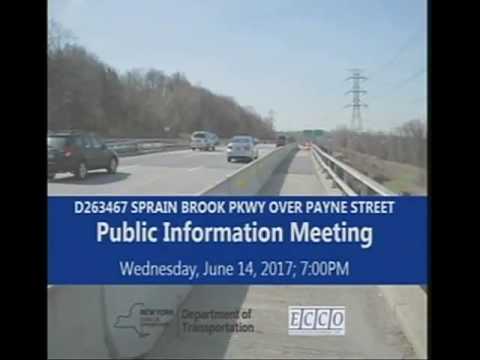 Spring 2018 may include the completion of some items of work both along Payne Street and the Sprain Brook Parkway, Tirums said. This is likely to include final asphalt paving, concrete sidewalks, street lighting, northbound bridge deck overlay, topsoil and seeding and any other miscellaneous items of work that weren’t able to be completed in 2017, Tirums said.